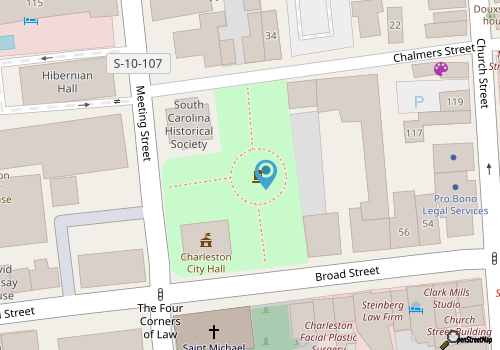 Located in the heart of downtown, and surrounded by impressive community offices and buildings including the Charleston City Hall, the South Carolina Historical Society, and the historic courthouse, the park anchors the historic district's landscape with a half square block of green space that is uncommonly beautiful in an otherwise busy region. A perfect spot to pull up a bench and enjoy a breath of fresh air, the park is a perfect "rest stop" for any Charleston visitor on a far-reaching historical tour. The park borders a full block of Meeting Street, in between the intersections of Meeting Street and Broad Street, and Meeting Street and Chalmers Street. 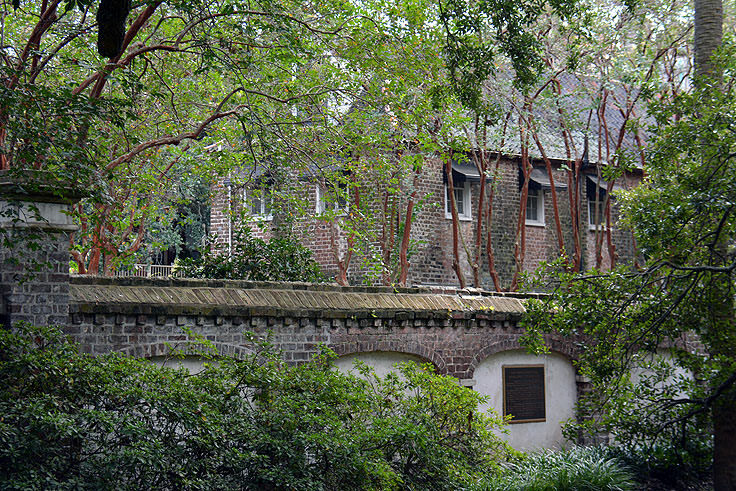 One of the first public parks in Charleston, and fittingly located in the heart of the historic district, the park was originally home to "Corbett's Thatched Tavern" before it was repurposed as a public gathering space and official city square in 1818. It retained the moniker of the Charleston "city square" until 1881, when it was renamed in honor of the first American president, and its newfound title was painted over the entrance gates to mark the distinction. Bordered by wrought iron gates and palmetto trees - a hallmark of Charleston's most notable properties and sites - the park is a small 1.48 acres but shines as a natural respite in the heart of the city, as well as a free source of much needed shade on a busy summer day. The ironwork borders are part of the charm and evoke Charleston's surprisingly large collections of Gothic architecture, while inside the park, visitors will be wowed by the natural surrounding beauty. Light pink and magenta azaleas bloom with vigor in the spring and summer months, while mature live oaks, covered in Spanish moss, provide a canopy of cool green spaces where visitors can find a secluded bench and relax. Wood and stone benches are abundant in the park, in fact, as are wide brick pathways that lead visitors from one local site or statue to another. As to be expected, a number of historical monuments and statues call the Washington Square Park home, starting with one of the park's first additions, a monument in honor of General Pierre Beauregard, which can be found along the East Wall and which pays homage to the Confederate general who led the city's defenses in the beginning years of the Civil War. In the center of Washington Square Park, visitors will find a memorial that pays tribute to the Washington Light Infantry - an imposing 42' foot tall granite structure, and an 1891 addition, which is in fact a miniature version of the Washington Monument in Washington, D.C. Even George Washington himself can be found at the park as a statue designed by acclaimed sculptor Jon Michel, which stands in the former site of an original William Pitt the Elder statue that was destroyed - or rather decapitated -by a falling tree branch in 1938. Local food and drink vendors can often be spotted by the park's edges as the site is easily a favorite distraction and rest stop for Charleston movers and shakers, and visitors alike. Bordered by countless in-use governmental buildings and historic sites, on a perfectly sunny day, the park's patrons are a fun mix of businessmen and women in suits, families with energetic kids, and tourists who are snapping pictures of the historic foliage and accompanying statues. All in all, the park is a perfect mini-representation of the city of Charleston itself, and offers anyone passing through an easy-going stroll or a quiet break from the sun and busy sounds of the aptly named Meeting Street. Because Charleston itself is so entrenched in its history, it should come as no surprise that its favorite parks, like the Washington Square Park, have a deep centuries-old legacy of their own. 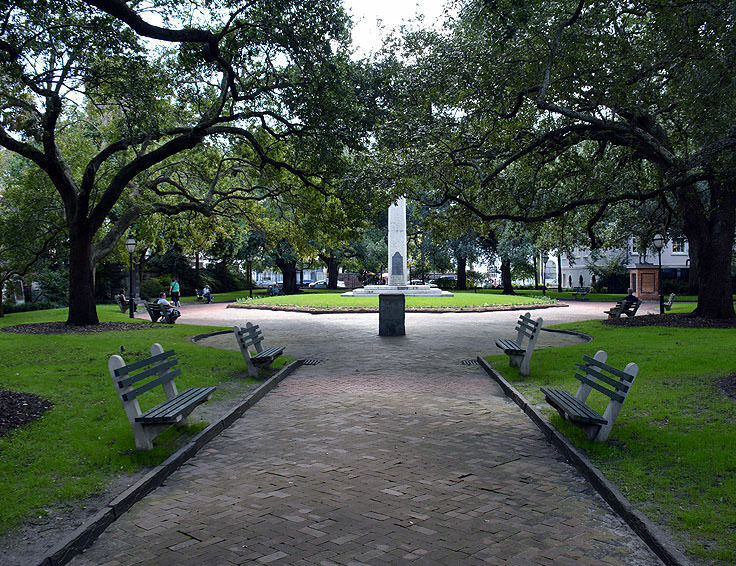 Naturally beautiful, and a favorite break during a self-guided or professionally guided historic tour, Washington Square Park brings Charleston's legacy to life in a beautifully green, always growing, and altogether impressive central location.